Adventure Time Vol. 9: Brain Robbers Review – AiPT! Although I do not know the insides and outs of Adventure Time, any time I get the chance to watch the show on Cartoon Network, I am just enthralled by the surreal and hilarious adventures of Jake the Dog and Finn the Human, thus having a good enough knowledge of who the characters are and the kingdoms where they are based. As someone who doesn’t usually read comic tie-ins to popular cartoons, I thought to give this graphic novel a go. Following a tough night of babysitting Tree Trunks and Mr. Pig’s adopted child Sweet P, Finn and Jake, along with their sentient robot BMO, set off on another adventure when Lumpy Space Princess asks for Tree Trunks’ guidance through the Ooo Badlands in order to find the Zombie Twins’ stolen treasure. As you can tell from the above synopsis, if you are a fan of the show, this book will feel like watching an extended episode whilst retaining the TV continuity. However, if you have no knowledge of Pendleton Ward’s creation, you will not have the patience to adjust to the surreal nature of the Land of Ooo, as well as the occasional random appearances from known characters such as the Ice King. Although Finn and Jake are prominent figures in this story, it is really about the dynamic between Tree Trunks and Lumpy Space Princess as you have two diverse female characters interacting throughout this Thelma and Louise-esque road trip, from the former being the loving nurturer to everyone, whilst the latter is spoiled and self-centered and by the end of the story, doesn’t really learn anything. Having previously written Adventure Time graphic novels, Josh Trujillo nails the characterizations and whilst reading his dialogue, you can hear the distinct voices from these characters, who despite being their otherworldly creatures, behave like everyday humanity, such as doing a heart-brain score from an issue of Lumps Magazine. Part of the joy in Adventure Time is because of its unique fantasy setting, it mashes up various genres and in the case of Brain Robbers, it is primarily riffing on westerns and even based on the title, it features zombies. In regards to the Zombie Twins, it does lead to a subplot involving Jake losing his brain after a battle with one of the twins, and for most of the book, Jake is a mindless corpse, which quickly runs out of steam, although the resolution is a proper fist-pump moment for both the boy and his shape-shifting dog. As artist for the Adventure Time comics, Zachary Sterling captures the simplistic yet surreal surroundings of the Land of Ooo as well as its expressive inhabitants, ranging from funny to creepy moments. Plus, any time Jake gets to show off his elastic capabilities, Sterling provides plenty of visual comedy, including a hilarious reference to My Neighbour Totoro. 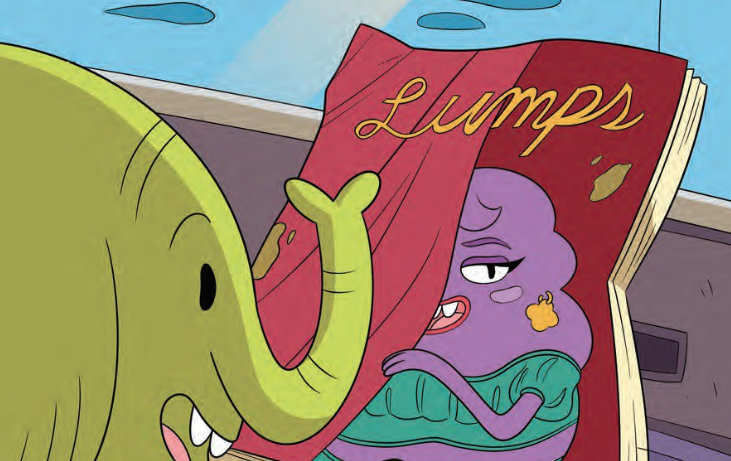 If you are a fan of the popular Cartoon Network show, you’ll be on board with this brain-robbing adventure that is centrally about two terrific diverse female leads, a small loving elephant and a self-centered lump.